The Master in Chemical Biology programme will teach students how to probe biological problems at the molecular level using innovative chemistry, biochemistry and biophysical approaches. Students have the opportunity to gain diverse theoretical knowledge in the field of chemical biology and to perform research in labs pushing the state of the art. Students will be embedded within the NCCR network of laboratories where they will receive individualized and highly interdisciplinary training (in biology, chemistry, physics) from world-renowned researchers. Students will have also access to all the extracurricular activities organized by the NCCR Chemical Biology (seminars, symposia, mentoring, support of women in science, career shaping advice, soft skills training, etc.). The Master in Chemical Biology is ideally suited to young scientists that envision themselves following a career in research. Bachelor degree holders in the sciences, especially chemistry, biology, biochemistry, biophysics or equivalent, wishing to orient their career toward chemical biology, whether in an academic or industrial setting. Only motivated and above-average students in relevant disciplines are selected. Students should receive permission by the NCCR Education Committee. 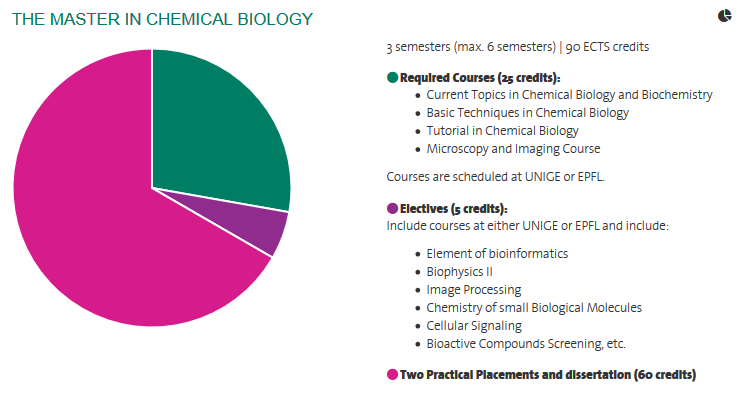 To apply for admission to the Master in Chemical Biology you will need to follow the instructions given on the UNIGE’s website. Essentially, this entails compiling the forms listed below. Case 1: You haven’t studied at UNIGE before. Enrollment application form. Applicants need to meet the basic conditions of enrollment of UNIGE. Admission form : In case you meet the conditions of enrollment, a complete application file will have to be sent to the Admissions Office from the beginning of next January until next February 28 on the latest (post stamp being evidence) for those who need a visa to stay longer than 90 days in Switzerland, and April 30 for others, for the following Fall semester. NCCR Chemical Biology admission form. This application is directly evaluated by the NCCR Chemical Biology Educational Committee. Case 2: You have studied at UNIGE before, please click here. Case 3: You are currently a UNIGE student, Faculty of Sciences. You will just need to fill a form given by the Secrétariat des Etudiants and submit the online NCCR Chemical Biology Master Programme application form. There is no deadline for submitting either applications. You can apply even if you have not yet received your bachelor’s degree but expect to complete it within 6 months. For additional information, please visit the UNIGE’s website. The NCCR Chemical Biology is part of the Excellence Fellowship Programme of the Faculty of Sciences. The programme is open to outstanding and highly motivated students from any university. Successful applicants will be amongst the top 10% of their peers in their bachelor’s program. Selection of the applicants is based on excellence and evaluation is given on the basis of the documentation sent by the applicants. All students enrolled in the programme and which do not receive any kind of financial support receive a monthly stipend for 9 months, starting 3 months after the beginning of their 2 semesters internship for their master projects. The enrollment period for the academic year 2019/2020 is open. Feb. 28, 2019 for applicants who require a visa. April 30, 2019 for the others.